Old Copper~Brass Kettles~Nice Premier System~. See pictures for condition and details Any questions please ask Dispatched with Royal Mail 2nd Class. 8 1/4" high and 8" wide solid brass kettle with amber glass handle. sides non to bad back corner dinged up see last photo. Antique Copper And Brass Spirit Kettle. Stamped with makers mark LOVERODGE WOLVERHAMPTON Rd 23742 please note that this is not a full size kettle and I couldn’t comment if it is to be actually used, I consider it personally an ornate object. Having a clear out so there is a few copper and brass items that will be up for auction. Dispatched with Royal Mail 2nd Class. Here for sale is a Job Lot 3 Brass Teapots/ Coffee Pot/Kettle, One Stand. large kettle 27 cm tall on stand. 100% of the money raised from the sale of this item will fund our animal welfare work in the community. All Copper and Brass. Superb clean condition, with no leaks, All excellent. Really nice item ,and been well looked after for many years now. Showing some signs of age and use as you would expect of an item of this age. 12" x 5 1/2" x 4 3/4" in ht. Stamped to the base W,T & S-Rd623634. 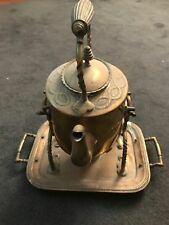 ANTIQUE VICTORIAN BRASS KETTLE BURNER STAND COLLECTABLE. Dispatched with Royal Mail 2nd Class. Small Antique Brass And Copper Kettle. Dispatched with Royal Mail 2nd Class. Antique Brass Kettle Great Patina. Antique Brass Kettle. Shows signs of use. Brass Kettle and Trivet for decorative use. Looks lovely on a hearth. Kettle and trivet are similar in design, but probably not a matching set originally. Nice old brass kettle and stand, quite heavy. See pictures for condition details. Attractive Antique Brass Kettle With Burner Stand.